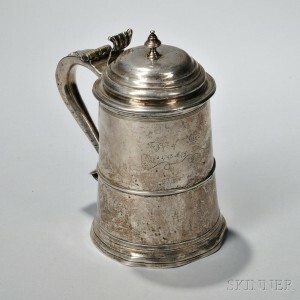 Silver Tankard Tells a Fascinating Story | Skinner Inc. Objects with old inscriptions or accompanied by even a shred of historical information often offer great potential for further research. Sometimes that research opens a window illuminating largely forgotten past events. One such object is an 18th century silver tankard made by Boston silversmith John Burt, which is on offer in our Fall American Furniture & Decorative Arts Auction (2855B) on October 25th in Boston. Like most other American tankards of the mid-18th century it has a beautiful turned and stepped domed lid that covers a tapered cylindrical body mounting a hollow scroll handle. What is a bit less typical, however, is the inscription engraved on its side. The inscription reads “The Gift of John Swan who Died/May 1 1743 Æ 75 To his Son John Swan.” Genealogical research reveals that the John Swan who died May 1, 1743 married Susannah Eastman (1673-1772) in 1699 and together they had at least seven children; their first-born child being John (1700-81) to whom the tankard was presented in 1743. The Indian attack occurred in 1676 in Haverhill, Massachusetts during the height of King Philip’s War when the small town was attacked by a band of Indians and the young Susannah Eastman was taken into captivity. According to family history, Susanna was trained as a “medicine woman” by her captors. Her exact whereabouts are unknown until 1693 when records document her marriage to her first husband Thomas Wood. In the spring of 1697, Susanna was again taken into captivity, her house burned, and her husband, according to the note was killed (although other historical sources indicate that he was either captured or escaped, but ultimately left the area.) She remained in captivity for the next two years before being released from captivity and returning to Haverhill. Later that year she married John Swan (1668-1743). Unfortunately for Susanna and her new husband John, their difficulties were not yet over. In August 1708 the Indians returned, according to legend, seeking to capture her for her knowledge of “medicine.” This time, however, she was determined not to return to captivity. According to one story, as the Indians attacked her home, she armed herself with a fireplace implement and impaled one of the attackers as he entered the house. That, and probably other efforts, seems to have repelled the attackers. Soon after the attack, Susanna and John moved to Stonington, Connecticut where they lived out the rest of their lives. 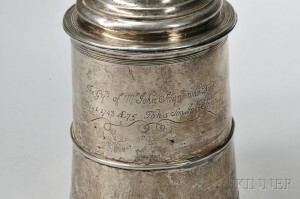 Upon John’s death in 1743, the silver tankard was presented to his and Susanna’s son John. Histories published in the 19th century document Hannah’s life and captivity to varying degrees and like other early stories, some of the facts are lost to time. John’s tankard, however, is a tangible object that has survived from her marriage to John and lovingly preserved for countless generations with its old worn note cracking the window to the past and making sure that neither Susanna’s nor John’s history is forgotten. We encourage you to preview this historic object and all of the lots in this auction during our Gallery Walk on Friday, October 23rd, at 6PM at 63 Park Plaza, Boston. This entry was posted in Blog and tagged american decorative arts, American silver, silver, silver stein, tankard by Christopher D. Fox. Bookmark the permalink. Thank you for taking the time to discuss the Chamberlaine tankard. Since you are in Boston, it may also interest you to know that I am a direct descendant of Mary Dyer (on my maternal, Chamberlaine side). Again, I appreciate your information and enjoy your excellent online communications.